Lang signs new contract – but who will be the next? The announcement of a new two-year contract for the 19-year-old Callum Lang came at an opportune time. It left Wigan Athletic time to consolidate their investment in a player who has the potential to play in the upper tiers of English football. Lang is to be sent off on loan until January to Oldham Athletic, who were last season relegated to League 2. 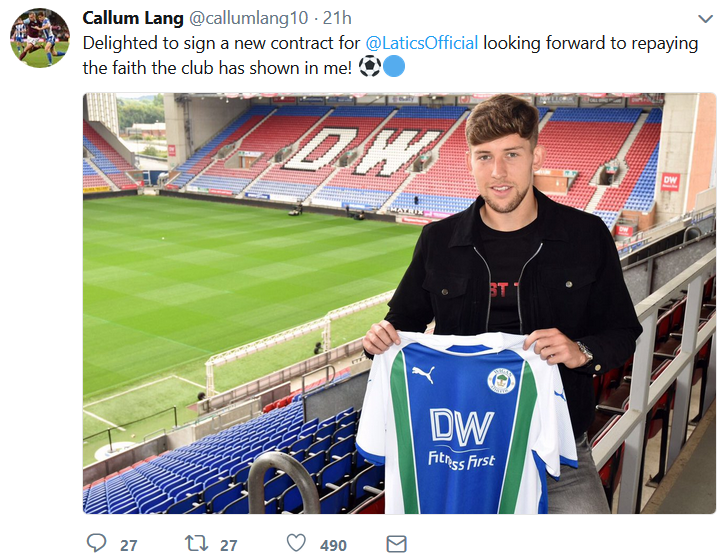 It was in mid-May that the media reported that Everton were interested in signing Lang, who was in the Liverpool academy until he joined Latics at the age of 14. He made his Wigan debut in a League Cup game against Blackpool in August 2017 before being loaned to Morecambe for the season. The 5 ft 11 in tall Lang had a successful loan with the Shrimps, making 14 starts, 16 substitute appearances and scoring 10 goals. Although regarded as a centre forward at Wigan, Lang would often play behind the central striker at Morecambe. In modern football the majority of the clubs in the top tiers rarely give their young players an extended run in their senior team. The norm is that they are sent on loan to clubs in lower divisions, giving them first team experience in a competitive environment, thereby maximising their value in the transfer market. It is a minority who go back to their parent clubs and establish themselves as first team regulars. So, what are the chances of Lang becoming a major player for Latics? Wigan Athletic has sadly been a graveyard for young players over recent years. The most recent success story was Leighton Baines and he left for Everton in 2007. So many youngsters have shown promise at youth level and looked destined for higher things, only to depart to clubs in the lower tiers. Latics managers, under pressure for results, have been reluctant to throw youngsters into the fray. But finding suitable loans for young players has never been easy for Wigan. Last season saw Latics sending six homegrown youngsters on loan to non-league clubs. Three of those have since left the club. Sam Stubbs went to Crewe Alexandra until January, then to AFC Fylde. He too has departed the club. On the club website Callum Lang is listed with the development squad, but the 16-year-old Joe Gelhardt listed with the senior squad. Gelhardt is clearly a bright young talent, already on the radar with big Premier League clubs. Providing Gelhardt is not snapped up can we seriously expect him to contend for a place in the senior team? 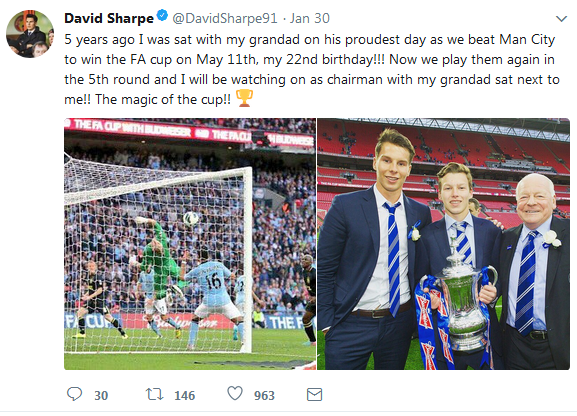 Admittedly, he came on as a substitute in the League Cup defeat at Rotherham, but would Cook even think of giving him an opportunity in a league game? Lang clearly benefitted from his time in League 2, playing at a club that was struggling to avoid relegation. At the time it was at a level just one tier below where Latics were. Should he make a success in the first half of the season at Oldham, could he contend for a first team place at Wigan in January? Latics currently have four centre forwards in their senior squad. Given that one is likely to leave there would remain three who would be above Lang in the pecking order. If Lang were to become a candidate for the number 10 role he would compete with Nick Powell, Gary Roberts and possibly Jamie Walker. The probability is that Lang would be sent off on loan again in January. Given that Lang has been offered an extended contract, what will happen with the senior squad players whose current deals expire next summer? They include Nathan Byrne, Gavin Massey, Shaun MacDonald, Sam Morsy, Nick Powell and James Vaughan. Having already lost Dan Burn in the last year of his contract, can we expect more departures via the loan-to-buy route? Why are the futures of these players still left hanging? Some fans will cite the change in the ownership as the main issue involved in the contract renewals, but it could amount to more than that. There is a possibility that at least one of those players will leave in the next couple of weeks, together with loans and loan-to-buy deals for those on longer contracts. Cook’s squad is currently unbalanced with a wealth of midfielders and forwards, but a lack of experienced defenders. He can be expected to rebalance the squad. On the other hand, Will Grigg and Michael Jacobs were in a similar position this time last year. Both went on to sign contracts to bind them to the club until summer 2020, Grigg’s deal being announced in early September and Jacobs’ in mid-October 2017. Offering Callum Lang, a new contract was a good move by the club. We can only hope they can be equally judicious in their dealings with those key senior squad players whose contracts are winding down. It was another of those games when Wigan Athletic had their chances, but just could not put the ball into the back of the net. Although not at their best, Wigan played some quality football at times against a Peterborough side keen to get a result. The visitors gave a good account of themselves, looking better than their current 9th position placing in League 1. A third consecutive goalless draw at the DW Stadium is hardly the kind of thing that will attract the “floating” fan. Saturday’s attendance was 8,602 which included 399 from Peterborough. The average for the season so far is 9,084. But despite the goalless draws, Latics have collected 21 points over the past 10 matches. Although they have scored just one goal in their last four league matches, they have not conceded a goal in the last seven. However, they will be keeping a close eye on Blackburn Rovers, undefeated in 15 league matches. Over the last ten they have gathered 24 points to Wigan’s 21. 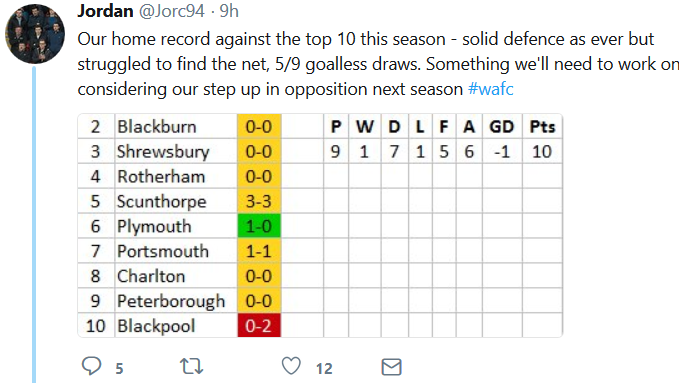 They had an important 3-1 win over Shrewsbury on Saturday, bringing them to within 5 points of Latics, 2 points behind the Shrews. When Aston Villa won the First Division title in the 1980/81 season they used only 14 players in a 42-game season. In contrast, Chelsea employed 24 to win last season’s Premier League in a season of 38 matches. In modern day the strength of the entire squad has become of increasing importance, not only in the first tier of English football. When Sheffield United won the League 1 title last season they used 28 players. When Gary Caldwell’s Latics won it the previous season they had 36 players involved. The key to promotion from League 1 has typically been to have a nucleus of players who are regular names on the team sheet, together with quality back-up. Paul Cook’s recruitment over summer provided him with just that. That Wigan Athletic are top of the division at this stage of the season is no surprise, given the ability and experience of the core players and the quality in depth that they have. Only Blackburn Rovers have the kind of squad that can come close to Cook’s in terms of quality. They too are serious challengers for automatic promotion. Shrewsbury Town have been the surprise team of the season. They do not have a squad with the depth of those of Latics or Blackburn, but continue to challenge for automatic promotion. Their success has largely been based on the successful chemistry between a nucleus of players largely drawn from the lower leagues. In fact, 10 of their squad have played in 23 games or more of the 26 they have played so far. Back in 1980/81 Aston Villa employed such a small number of players during the season for several reasons. One is that teams were only allowed to use one substitute in that era. But a key factor is that their key players stayed clear of injury and suspensions. Shrewsbury are a physically competitive team, not afraid to disrupt the opposition’s game. However, they are well disciplined and have received just one red card and 33 yellows in 26 league games. Should they manage to stay clear of injuries they could well sustain their challenge at the top of the table. Given the impending takeover of the club by a Far East consortium, it has been hard to predict the short-term effects the potential change would have. Despite the uncertainty of what will happen under new ownership, Cook has seemingly managed to keep the players focused, judging by the points accrued during an 11-game unbeaten run. Given the scenario, policy in the transfer market was going to be difficult to predict. Would it be driven by the current ownership or the future buyers? Up to this point the recruitment in the January window bears the hallmark of the current ownership. Lee Evans left for Sheffield United, after they paid Wolves £750,000 for his services. Two other loan players, Matija Sarkic and Ivan Toney, have been recalled by their parent clubs, through lack of game time at Wigan. Cook will be hoping he can cling on to his other two loan players, Christian Walton and Callum Elder. The arrivals of Jamie Walker and James Vaughan will strengthen the squad, their bargain price signings being typical of the Sharpe era. But we have come to expect the club to seek incoming funds to compensate for the £500,000 or so that has been spent. It appears that Jack Byrne is going to Oldham on a permanent contract, although it is unclear how much compensation, if any, Latics will receive. Can we expect more departures? The surprise up to this point is that there have been no rumours linking Latics to a right full back, as back-up for Nathan Byrne. Walker will effectively take Jack Byrne’s place in the squad, with Vaughan replacing Toney. Another winger would certainly strengthen the squad and Latics have been linked to Morton’s Jai Quitongo, who could be picked up at a bargain price since his contract expires in summer. Having already lost three loan players, Cook will surely also be scouring the loan market to add to his squad. Should Alan Nixon be correct in his estimate of 10 more days, the takeover will happen before the ending of the transfer window. However, by then we can expect most of Cook’s adjustments to the squad to have been finalised. He will continue to focus on promotion back to the Championship. Should that happen, and Cook continue to be in charge, we can expect major transfer activity in summer. We can only hope that the new ownership will invest more seriously in the squad than the current incumbents did in the summer of 2016. It remains to be seen whether the consortium would be willing to go a stage further by putting up the kind of money needed to challenge for a place back in the Premier League.